In case you had not yet noticed, I like to cook. I also like to share. Coming together with friends, family, colleagues, anyone, over food is always a most pleasing experience. This week at work, we held our last team meeting for the year. We organised an afternoon tea to celebrate the end of another year and of course, Christmas. We were all to 'bring a plate," which naturally got me racking my brain for something delectable to bring along. I wanted my contribution to be homemade, festive and of course delicious, but as usual it had to be relatively quick and easy to make. When I stumbled across this recipe, I knew right away that I had to make it and share it with my colleagues. 1. 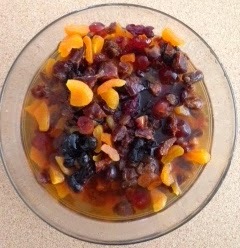 Place dried fruit in a large glass bowl and pour over black tea. Cover with glad wrap and leave to soak overnight. 2. Preheat oven to 180 C (or 160C fan forced) and line a large baking tin with baking paper. 3. Sift the flour over the combined fruit and tea. Stir well to combine. 4. Transfer the mixture into the lined baking tin. Bake in the pre-heated oven for about 2-2.5 hours, or until golden on top and a skewer comes out clean. 5. When cooked, remove from oven and allow to cool slightly before turning out onto a wire rack. 6. Cut into pieces and enjoy with a cuppa for a festive treat! 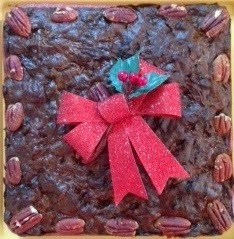 The finished product, studded with pecan halves and decorated with Christmas decorations. - Adding cinnamon, mixed spice, vanilla essence or cocoa powder would also add another flavour dimension..... I'm sure a dash of brandy or sherry would also do the trick! - I'm sure you could experiment with various flours including wholemeal, coconut or spelt flour for an added nutrient boost. I really like that this cake was so easy to prepare but certainly made a statement when presented! It has an incredibly moist texture too. Even better is that there is no added fats or sugar in this recipe - a real rarity! Acknowledgement: I would like to acknowledge kidspot for the original recipe for this cake. It's too good not to share! !